Does the presence of a security cameras make us feel safer? Are we actually aware of them? How do they affect us? How many cameras have you passed today? This is a question that you probably would not expect to be asked from anyone. But why not? A surveillance camera is a very frequent and present element in our daily life, like a traffic sign, a bakery or other people. The difference is that surveillance cameras are present in a hidden layer of daily elements. People know that they exist, know what they are used for but are they actively aware of them? How comfortable are you knowing that you are being watched? There is a lot of theory about surveillance cameras, laws and regulations. But how is the topic of surveillance cameras reflected in the public opinion? In order to extend our theoretical knowledge, the perception and awareness of people about the presence of surveillance cameras has been researched. 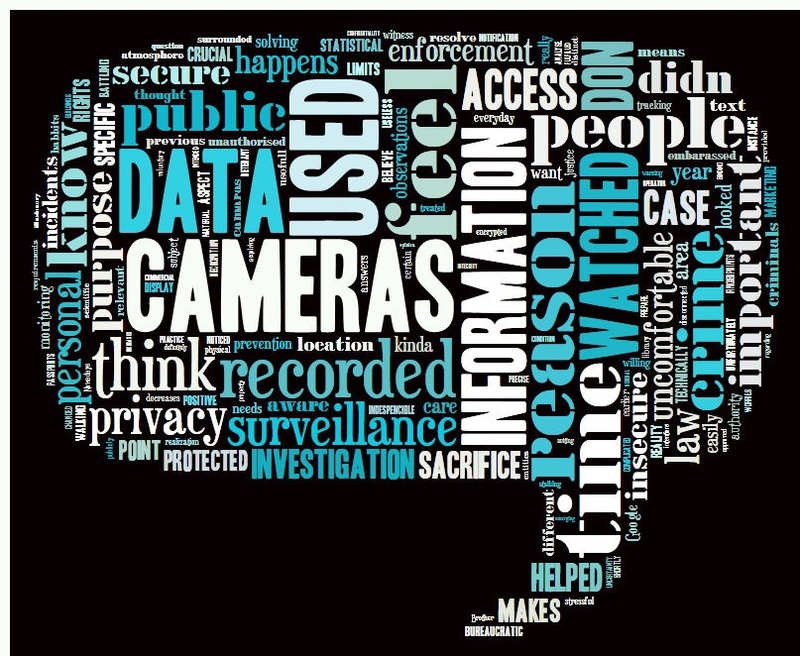 An online survey has been conducted questioning 60 subjects about privacy and surveillance cameras related matters. The main landscape revealed by this data is that there is no agreement. Responses were very balanced out and only in a few particular cases a clear direction is shown. The gathered data introduces some interesting results. In total there were 60 participants of the survey, 87% of them having a higher education. We found that there is no common agreement about the perception of surveillance cameras. People do not share an equal opinion about surveillance cameras. 22% disapproves of them, 35% approve of them but the missing 43% located themselves in between. This might indicate that the concept of surveillance cameras has not been given much thought, if any at all. There is, however, a difference between women and men – women approve more of surveillance cameras than men. A very interesting fact is that people generally are aware of the unawareness – 84% of the people say they are aware that they are being watched by security cameras only 50% of less of the time. Even though the majority assumed the neutral middle position when it comes to the general opinion about surveillance cameras, when crossing these results with the perceived awareness of people, it is noticeable that individuals who said they were never aware of being watched have the highest average approval of surveillance cameras. On the other hand, the lowest values of approval are from the people who said they are aware 75% of the time or always aware when they are being watched. These findings suggest that the more people disapprove of surveillance cameras, the more they think they are aware of the presence of cameras. The level of comfort and insecurity also differs according to gender. On average, women feel safer and more comfortable knowing that there are surveillance cameras. Men, on the other hand, assume to have both lower levels of security and comfort in the same situation. The pattern of unanimity continues when observing the questions about comfort and insecurity around surveillance cameras. A general direction is that people tend to feel uncomfortable when they know that they are in an area where surveillance cameras are installed. On the other hand, the trend goes to feeling safer when there are cameras. Associating this with the general approval of surveillance cameras, data shows that the level of comfort and the level of security grow higher, the more the person approves of surveillance cameras. Given the existing legislation in the Netherlands, it is mandatory to notify the public when surveillance cameras are active. The relevance of this factor is also mirrored in the answers of the survey – 55% of the questioned individuals consider it indispensable to be informed about the presence of surveillance cameras. There are, however, different opinions about the context and placement of the cameras. Some people disapprove of the cameras in specific contexts when there is no signalization but others change this opinion, as long as they are informed about the installation of surveillance cameras. The main reasons for approving of surveillance cameras with or without signalization are security reasons and the presence of an ATMs (automated banking machines). An exception is the hospital – what predominated was not approving cameras in case it was not signalized. This, however, changed when there were signs. Another situation that is relevant mentioning is using surveillance cameras secretly by the police for criminal investigations. More than half of the participants gave a positive reaction to this. The opposite perspective also happens – no matter if there is signalization or not, using surveillance cameras for controlling employees at work, installed on private property but covering public space and in schools and libraries is always disapproved. Recorded data by the surveillance cameras is stored, most of the people are aware of that. But what actually happens to the data is a mystery. Most of the people assume that it will be used in case there is an incident. But also a relevant part thinks that it is frequently controlled (17%) or even watched live (14%). But that something will happen to the data is a major assumption – only 5% think that no one will ever see the data. Only very few people don’t care about the use of the recorded data. For 40 of the questioned people, no one should ever have access to the recorded data, unless it is needed to solve a crime whereas 14 individuals would only grant the access to authorities. There is a relation between the general opinion of surveillance cameras and the worry about the use of the recorded data: individuals that disapprove more of surveillance cameras were the ones that reported higher worry levels. The same pattern occurs when relating the general opinion about surveillance cameras to the opinion of how long the data should be stored – the more they disapprove, the shorter they think the data should be stored. There were some slightly contradictory answers when comparing the small number of people who do not care what happens to the recorded data and their behavior. People were asked about their behavior given certain scenarios and, even though most of the people do care what happens to the recorded data, in the majority of the scenarios people claim not to modify their behavior. This only changes at their working place, school, university or library and in traffic. The use of surveillance cameras for security reasons is a generally accepted concept by the inquired people. But another interesting aspect is the opinion of people about using this technology for other purposes such as marketing research. Actually, 19% of the people who took the survey think that the collected data is used for marketing research. There are even 7 people who consider it ok without signalization or notification of the costumers. But the majority disapproves of using the data for marketing research, no matter if it is signaled or not. A few people mentioned their concern about the data “leaking” to the internet or television, by people who have access to it or by being sold to television companies. Here, the opinions were not as similar anymore. There answers split into three equal parts – the people who think it is ok to find a missing person, using these methods; people who consider the level of detail captured by the cameras too high; and people who consider that this kind of usage of the surveillance cameras violates the right of privacy, especially if the woman did not want to be found. The fact that this amount of details has been made public has also been criticized: “There is no need to go into small detail in a newspaper article. Stating the region where last seen and visual details is enough for finding a person”. Women approve more of surveillance cameras in general and it were also women who approved more of using this kind of research to find the missing women. Men, on the other hand, were the ones who disapproved more. Generally, people who had a better general opinion about surveillance cameras also were more supportive of this situation. People who consider that this violates the right of privacy also have, on average, a lower general opinion about surveillance cameras. After getting insight into these opinions it is understandable why the policies differ from country to country and why there is need for such complex regulations. People’s opinions differ significantly and a solution with which everyone would agree is out of sight. There have been other surveys and research to understand the opinion about surveillance cameras and their impact on daily life. Most of these findings point to the same main conclusions that were drawn from the survey previously discussed. For instance, a survey from 2011, comissioned by Syntectics and conducted by the ICM interviewed a sample of 2.027 adults across the United Kingdom. The survey shows that the public support for CCTV has increased since the riots happened in 2011. The main conclusions drawn were in agreement with the survey conducted for Watching the Watchers: The big majority supports the usage of recorded data to solve a crime - in this case, to identify rioters. Also, 76% feel safer in public areas knowing that cameras are installed (compared to 51%). Another example is a survey released by the Syracuse police about neighborhood surveillance of the Near West Side, Syracuse. The survey was conducted after protests at the City Hall against a proposed instalation of surveillance cameras. It was argued that "recent violence has proven that the need for safety outweighs the loss of privacy that would result in cameras controlled by police." 210 residences have been interviewed and 88% said that cameras would make them feel safer in areas they normally avoid and 89% said that cameras would make them feel safer in their own homes. More important and, in comparison to our questionnaire, the neighborhood questionnaire revealed that 84% indicate that they would support a blue light near the cameras to make them more visible - the need for signalization and information about being watched presists. There was a very high support of the usage of cameras by the police to fight crimes, which is also mirrowed in our survey (96% from the neighborhood questionnaire and 90% from the current survey). the presence of surveillance cameras until being asked about it.” (2009:45) This could be a possible explanation for the high number of respondents who positioned themselves in a neutral position towards surveillance cameras. 20%” (2009:44) This indicates that, when being made aware of cameras as tools to fight crime, the support of surveillance cameras grows. In order to verify if the support of cameras without this influence stays similar, another survey would have to be conducted which does not lead the respondents into a certain direction. It is important to note that the data from the Watching the Watchers survey has been gathered making referrence to security and fight against crime. This means that the findings might be different when leaving these referrences out. To access the data set from the Watching the Watchers survey, click here!